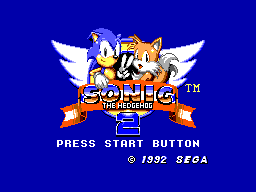 Sonic the Hedgehog 2 was one of the most popular Genesis games on the Megadrive/Genesis, and is considered by many as one of the best Sonic games of all time, if not, THE best Sonic game of all time. The Master System version however, is generally less well-known, and many who have heard of it may get the impression that it's just a watered-down port of the Megadrive classic. But the truth is, Sonic the Hedgehog 2 is a completely different game, and not a single level is from the Megadrive game. The gameplay is very similar to other Sonic games, but this time on the Master System. You will run, jump, and spin through 7 Zones, each consisting of 2 levels and a boss. Each zone in the game has something unique to it, to mix up the gameplay. For example, in the Under Ground Zone, you can ride mine carts throughout the level, and in Sky High Zone, you can ride hang-gliders. As with other Sonic games, the speed is what sets it apart from your typical platformer. Another thing that is unique to the Sonic games is the health system. Sonic is basically invincible from any attack as long as he is holding a ring. Rings in this game are basically coins. Get 100 of them, and you earn an extra life. If Sonic gets hit though, he loses all his rings, and if he gets hit when he isn't holding a ring, he's done for. I like the idea, as it's very unique, but in all honesty, it sometimes makes the game feel a little too forgiving. The game doesn't come without it's challenging parts though. During the boss battles, you don't get any rings, and a lot of the bosses can waste your lives before you know it unless you know their pattern. There are also a few tricky platforming sections, which are your worst enemy outside the boss battles, since a ring can't save you from a bottomless pit. The gameplay is fast-paced, unique, varied, and fun, and those are the things that 2D Sonic games are known for doing so well. Very few gripes here. The graphics are some of the best I've seen on the Master System. They're colorful and crisp, everything is nicely animated, and most impressive of all, there's no slowdown. With Sonic running through the levels at high speed, all the animated sprites (especially when there are heaps of rings on-screen), and highly detailed levels, you'd expect at least some flicker, but I have never once had the game lag on me. Every zone also has a different graphic style, that really makes it stand out from the rest. Sometimes even levels from the same zones may have slightly different graphics. I can't think of anything to complain about in the graphics department, it really shows what the Master System is capable of. Catchy, typical Sonic music on an 8-bit console. That's basically what you get from the Sonic 2 soundtrack. All the tunes sound great, and fit the levels they appear in perfectly. The sound effects sound a little generic, and everything sounds like the standard kind of thing you'd expect from a platformer. I have to give credit to the little jingle that plays whenever you get a Chaos Emerald though, it's so satisfying to hear after spending so much time looking all around for it. The controls in this game are fantastic, in all honesty I prefer the controls in this game more than the ones in the Megadrive Sonic games. Sonic moves responsively, when you want him to go forward, he goes forward, when you want him to jump, he jumps, and so on. 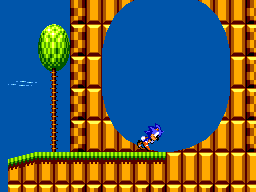 There's no spin-dash, but I've never had the kind of problems that I had in Sonic 1 on the Mega Drive, when I have to wait about 20 seconds for Sonic to get up a hill because I didn't get enough speed before going up the hill. You always feel like you have full control over Sonic though, you never feel like it's the controls fault that you died, and so on, so there's very little to complain about here. As I said in the Gameplay section, this game is tough before you get the hang of the bosses patterns, remember how to navigate the platforming sections, and so on. Once you get the hang of it though, you can speed through the game with relative ease. 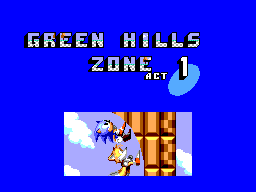 To promote a second play though, there are six Chaos Emeralds hidden throughout each Zone, which you have to collect in order to get the good ending. The Chaos Emeralds aren't awfully difficult to find, but you will have to explore around the stages a little to find out where they are. The game is a tad short, but chances are that you'll play through again either for the emeralds, or just for fun. Overall, Sonic 2 on the Master System is one of the best games on the Master System, and is a worthwhile addition to your collection. It's pretty common, so you should be able to pick up a cheap copy with ease. This game is also on Wii Virtual Console, for anyone who has a Wii, but no Master System. Highly recommended.